Actress Park Si Yeon (박시연) and f(x)'s Luna attended Johnny Hates Jazz fashion show held at Setec Hall 2 on October 24, 2010 at Seoul Fashion Week. 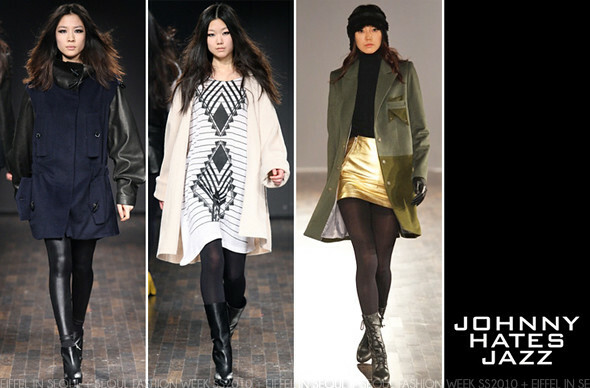 Park Si Yeon (박시연) arrived in Johnny Hates Jazz Fall 2010 coat and graphic print dress while Luna wore an outfit from the Fall 2009 collection. I love how Park Si Yeon styled her outfit but I thought the coat was a 2 size bigger. Not a huge fan of Luna's outfit and her very distracting blonde hair (change it up!) but I died for her shoes. Please stay tuned to Eiffel In Seoul for Johnny Hates Jazz Spring/Summer 2011 collection!